Above: Bond and Leiter visit one of Mr Big's clubs in Harlem. Above: The opening panel of "Live And Let Die"
The second in the series of the newspaper comic strips, Live And Let Die continues from the first outing, Casino Royale, by using James Bond as the narrator of the story. Above: Bond and Solitaire prepare themselves for the keel hauling. McLusky's opening panel re-uses the lettering from the original Fleming first edition hardback, but that is where the faithful adaptation ends. Writer Henry Gammidge came onboard the series, taking over from Anthony Hearn, and truncated a lot of Fleming's original narrative and back story to the main plot in order to compress the adventure down to just 15 weeks worth of strips. Gammidge's adaptation skips over a lot of Fleming's detail which would have slowed the pace of the strip down, and simplified the plot to work within the confines of the 3 cells a day format. 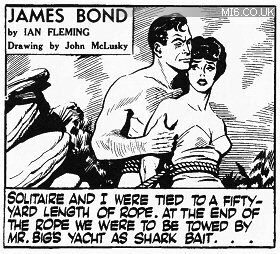 Although this lost some value from Fleming's original work, the adaptation works well in the strip format without the reader getting bogged down in lengthy dialogue or over-complicated scenes. Gammidge would stay on for another ten outings with artist McLusky, up until "You Only Live Twice" in 1966 (with the exception of "Dr. No", which was adapted by one-time Bond writer Peter O'Donnell). The artwork show a definite shift in style from McLusky's first outing, with increased contrast in the various character depictions, although McLusky's vision of Bond remained quite consistent up until the point where Sean Connery was cast in 1962. McLusky's' style is sharper and more cartoon-like than the realistic Casino Royale, and Live And Let Die can be seen as a foundation for the rest of his work on the first series. Above: Quarrel leads Bond to Mr Big's yacht. Mr Big (in a note on Leiter's body): "He disagreed with something that ate him. P.S. We have plenty more jokes as good as this"
Live And Let Die was the only comic strip to be republished in an annual in the UK. 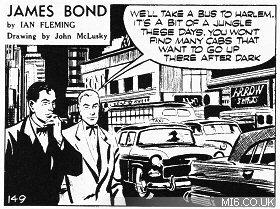 The strips were reformatted from their original 1958 cells strips into new layouts for the 1967 "James Bond Annual". Titles Included: "Casino Royale", "Moonraker", "Live And Let Die"